Neuroimaging has revolutionised the study of the human brain in the last 20 years. Statistical and probabilistic methods are vital core tools. For example, the development of methodology in random field theory and spatialtemporal modelling has led to some of the key medical and biological understandings about the function of the brain. Statistical neuroimaging requires strengths in all the themes (in particular [C, P, S]) and has the potential for the development of widely adoptable methods with significant impact in neuroscience. Below are some sample projects. To find out more, contact John Aston. Are there statistical relationships in language? 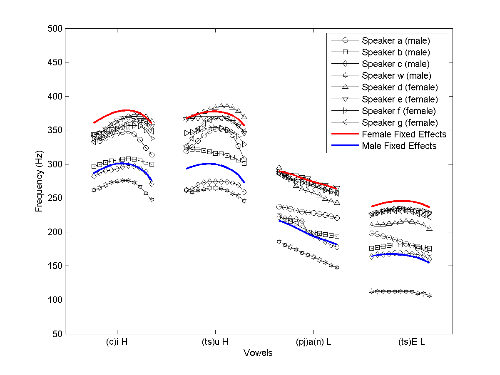 The graph shows the statistical model's estimated speech trajectories (using mixed effect models and functional data analysis, a technique for treating data as continuous curves in a function space rather than points) for males (blue) and females (red) when saying the word ``riverbank'' in the dialect Qiang, spoken in the Sichuan Province of China. Also on the graph are the actual speech recordings of eight native speakers of the language, who seem to match well with the model. More info can be found in the CRiSM research report, No. 08-25 by Aston, Chiou and Evans. When estimating the amount of neurotransmitters present in certain regions of the brain, it is important to recognise that there are both spatial and temporal relationships between the measurements taken. Using a multidimensional smoothing technique developed in functional data analysis and ordinary differential equation models for chemical kinetics, it is possible to determine the presence of receptors such as Opioid receptors (responsible for pain perception) in different brain regions, which can be used when studying diseases such as Epilepsy. The image shows a Positron Emission Tomography scan for Opioid receptors using the chemical [11-C]-Diprenorphine, which has been statistically smoothed to improve the concentration estimates. Further info can be found in the paper by Jiang, Aston and Wang.